This week I taught 2 two day classes on a sewing envelope I designed especially to teach at the Buggy Barn outdoor show. It was full of great techniques, lots of color and many pockets and compartments to hold all your special sewing supplies. 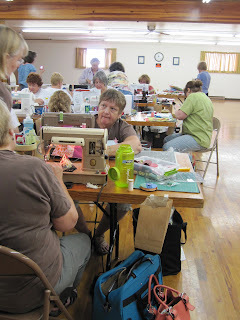 I had about 25 students in each class and they worked hard all two days assembling and embellishing. 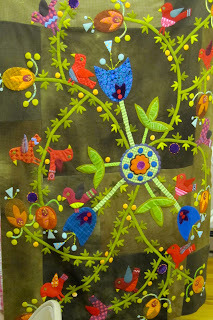 It has been a long time since I taught a machine and appliqué class. The pace was much faster than my embellishment classes but everyone kept up and I was amazed how much each one got done. The classes were held at the Grange with great catered lunches including wonderful deserts. 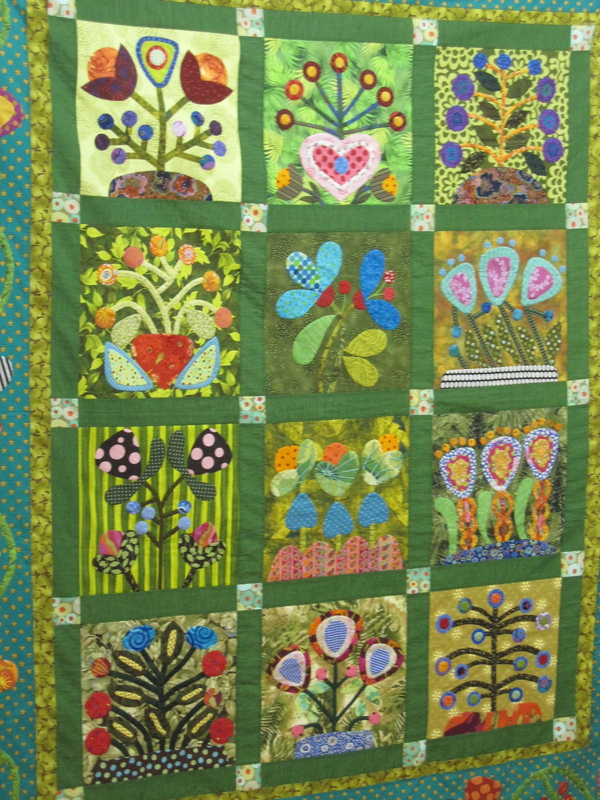 I was delighted as many students brought their quilts to share with me. 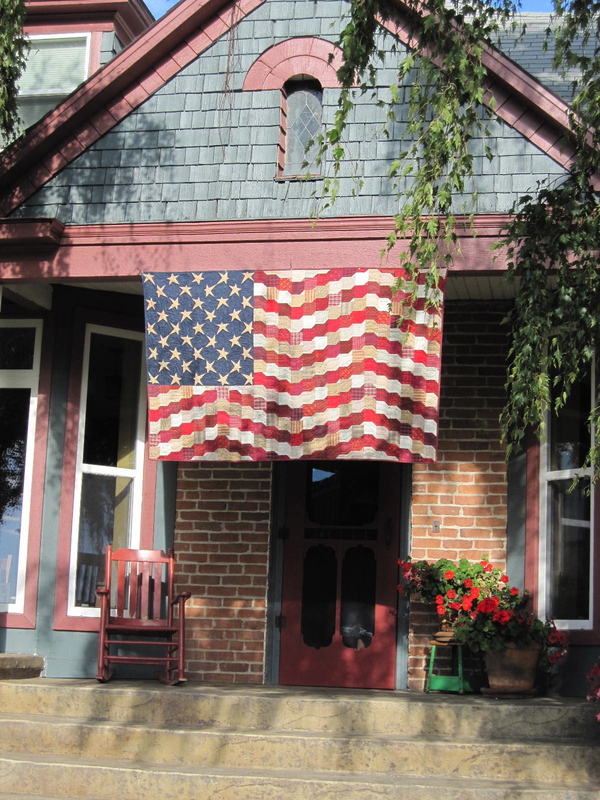 Manya from Tucson enlarged my Flowerbed quilt and made it out of all cotton fabrics. It was so bright and cheery. 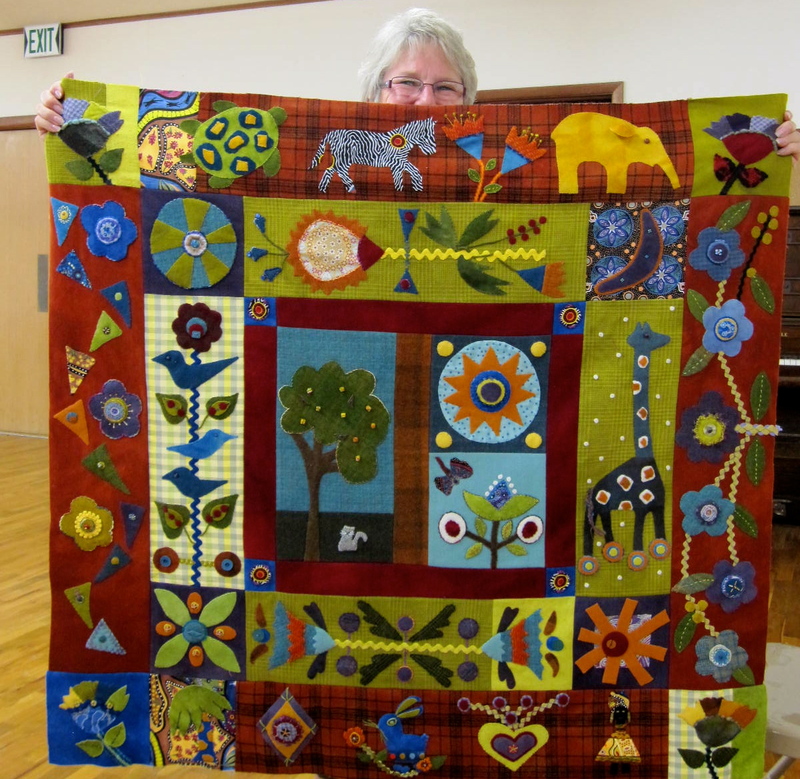 Gayle took a class from me at Empty Spools in Asilomar, CA earlier this year and started her Folklore Quilt. She had personalize many blocks with images from her own travels. 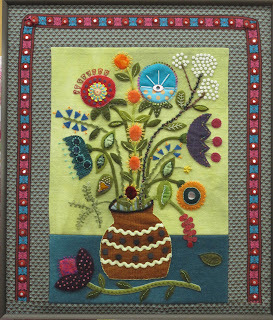 It was wonderful and we decided that she needed to border it with chartreuse wool. 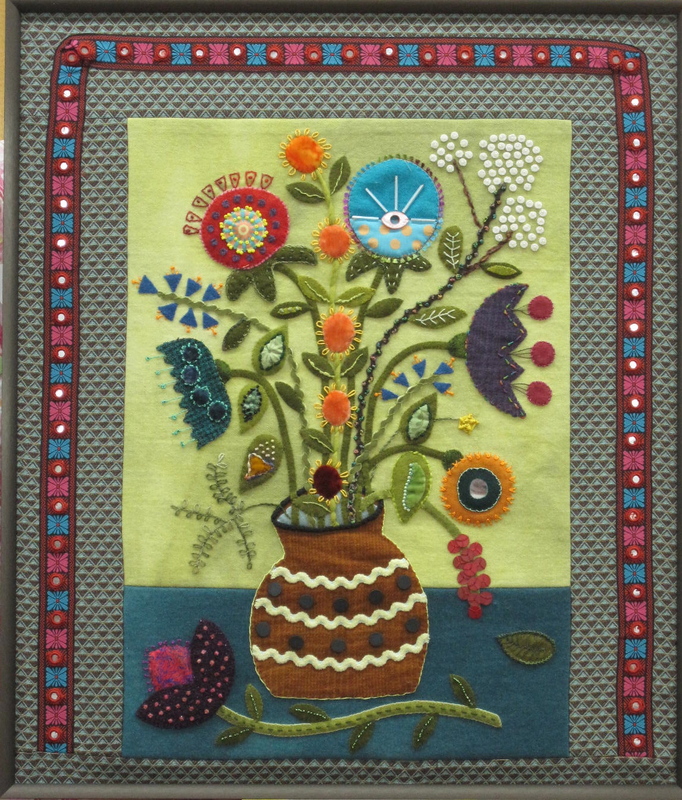 Karen from Canada finished and framed her Flowerpot quilt from a previous class. It was wonderfully embellished. She also brought her Robin Run the Hedge quilt to share. Susan also shared her Bluebird Needle Keeper. Pam and Janet did an amazing job organizing everything for this week long event. Every detail was carefully thought out with wonderful touches. The weather was perfect. No humidity so I was in heaven! As it was the 15th Anniversary they hosted a ‘Garden Party’ on Thursday evening. It was in Janet’s garden at the farm. 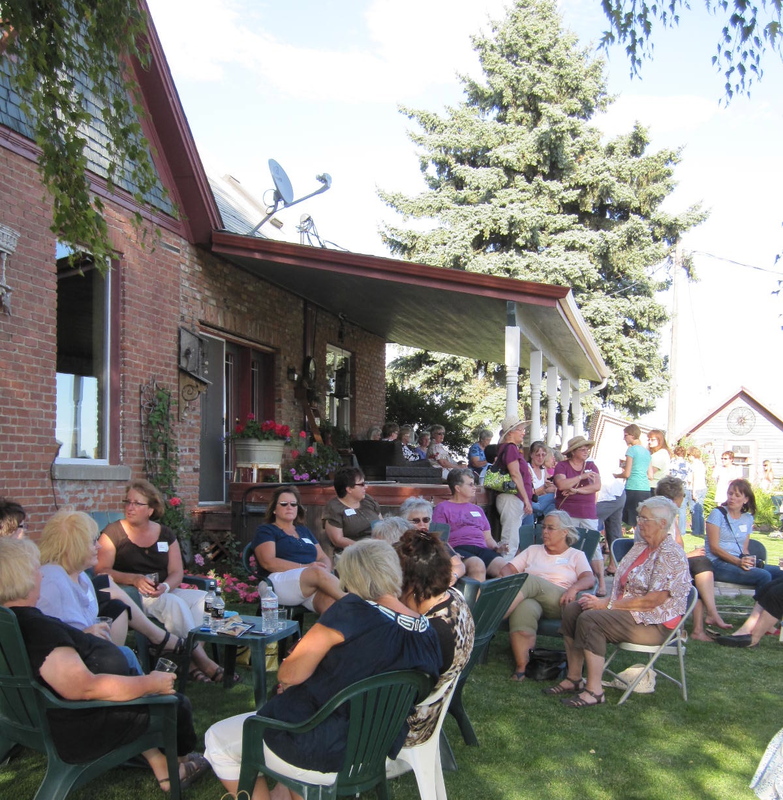 It was the perfect spot, the food was great and the entertainment entertaining. 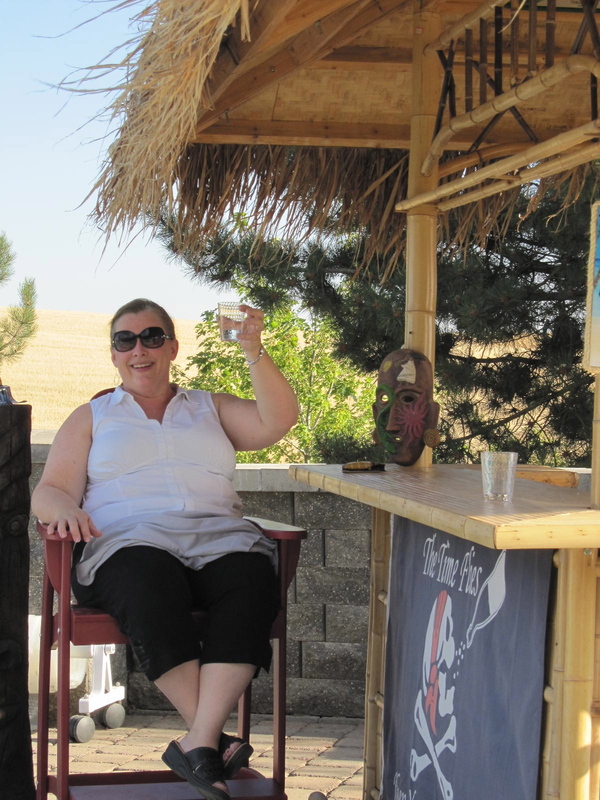 Jennifer Keltner the editor from American Patchwork and Quilting took in a little shade at the Tiki Bar prior to her lecture. 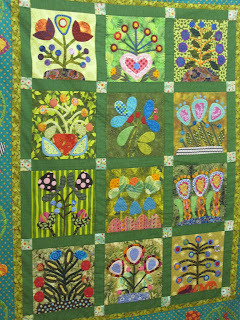 She entertained us with a peek preview of quilts from the new ‘Quilt Sampler’ magazine as we were served these scrumptious strawberries for desert. We also were treated to a very entertaining 15 year history of the Buggy Barn by Janet and Pam overlooking the wheat fields. 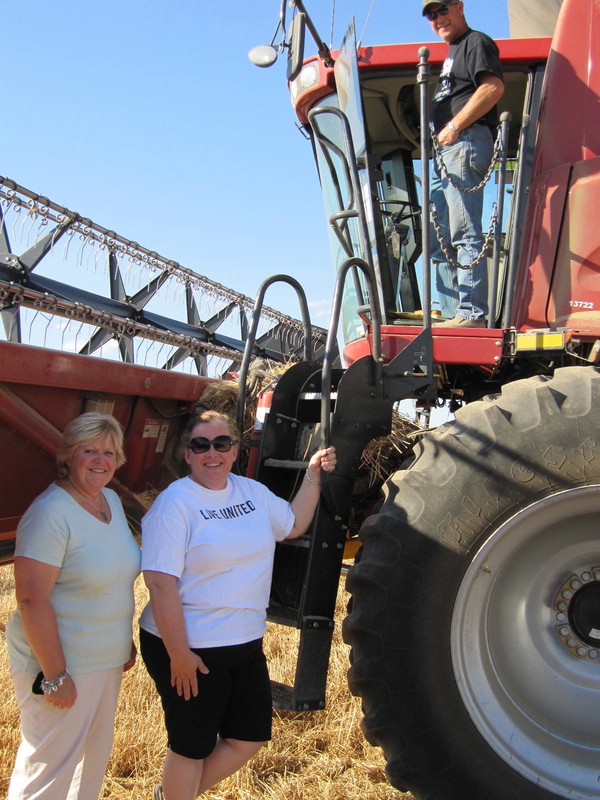 Once class was over on Friday Jennifer had organized for Ron Pam’s husband to take her out on the Combine as it is harvest time. I tootled along having never had that experience either. We laughter a lot as the city girls experienced a little farm life. It was an amazing experience! Ron harvests 3000 acres in Readon, WA and he was a wealth of knowledge about something I know nothing about. The view was spectacular as the wheat just glowed in the sunshine. We could see for miles. What an incredible machine we learnt lots and it was a neat experience. We finished the evening around the pool having margaritas and visiting with Pam, Ron, Janet, Tom and their friends. What a wonderful ending to a very busy week! I also was fortunate to be able to stay for the outdoor quilt show. Mom and Jason joined me on Saturday morning. I will be blogging about the show tomorrow. This entry was posted on Sunday, August 28th, 2011 at 11:58 pm	and is filed under Uncategorized. You can follow any responses to this entry through the RSS 2.0 feed. You can leave a response, or trackback from your own site. 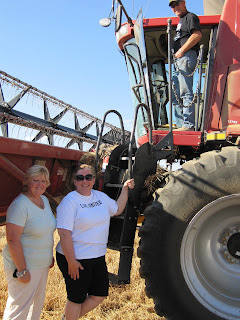 Hi Sue- You look like you got some sun out there combining wheat. I like your sewing envelope. Beautiful, are you going to make that available on your website? That medal chicken is sure cute! You bring out wonderful creativity in your students, Sue. I so enjoy following your blog. Best wishes- Betty in South Dakota. Sue, wonderful pictures. 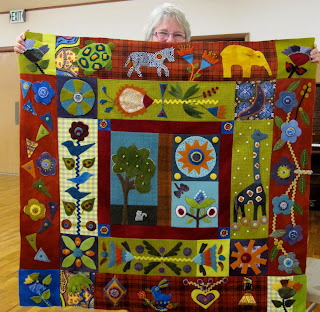 Bernice from Canada participated in your class, she's a member of our Yahoo group and was so excited to meet you and she posted awesome pictures of the projects that you taught and also of all the quilts hanging on the fences. What a stunning sight. sounds like an absolutely fabulous time Sue, what fun, and such creativity!! This really looks great. I love the sewing envelope!! What a wonderful event! Would have loved to be a participant! I like your work, they are beautiful.